Uninstalling a Hunter fan will require you to disassemble the fan housing completely and take it apart piece by piece. 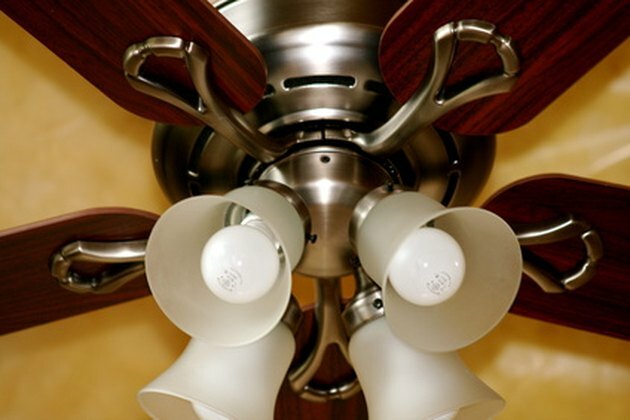 The Hunter fan, like all ceiling fans, has a motor that turns the blades, wires that connect the motor and the lights to the power source, downshafts that hold the fan in place, and housings that keep everything together. Once you clear away all of these parts, you will be able to remove the fan from the ceiling. Uninstalling a Hunter fan takes patience and focus. Shut off the power to the room where the fan is to make sure you don't get shocked while uninstalling the fan. Unscrew and remove any light bulbs that are attached to the fan. Twist and loosen the knobs holding the light-bulb covers to the fan and remove the covers. Unscrew the electrical light housing from the bottom of the fan using the flat-head screwdriver. Pull the housing off the fan and disconnect the electrical coupling that connects the lights to the power source by pulling the coupling apart with your hands. Remove the housing and the light-bulb sockets from the bottom of the fan. Unscrew the cover of the light housing from the bottom of the fan and remove it; the cover is attached with three screws. The electrical wires for the light are in a separate housing underneath the fan motor. This will open up the area of the fan blades. Unscrew each fan blade from the bottom of the motor with a Phillips screwdriver and pull the blade off the motor. Insert a flat-head screwdriver between the ceiling and the fan's trim ring, which has been snapped into place on the motor housing. Pry the trim ring off with the screwdriver. Loosen the three screws on the canopy that are located near the ceiling and turn the canopy until it slips down to expose the inner wires. The canopy covers the motor and holds it in place. Remove the caps from the wires and untwist the wires. Repeat for all wires, then disconnect the wires that extend from the ceiling to the fan. Unscrew the mounting bracket, which is the ring that attaches to the ceiling and holds the fan in place. Gently pull the mounting bracket away from the ceiling. Be careful to feed the ceiling wires through the downrod, which is the hollow tube in the center of the fan that holds the fan firmly, so that you are only removing the fan wires.